We built Giggle Ridge Adventure Golf back in 2000. It was the culmination of a twenty year dream. It wasn't long however until we began to dream and plan an ambitous expansion. For a number of reasons those plans never materialized and two years ago we sold Giggle Ridge to some great people, Chris and Liz Steunenburg. We shared our expansion plans with them of course. Last season they contacted me about working with them to do an even bigger and more ambitious expansion than the one we had dreamed. I of course happily agreed. As the details of the land lease were worked out I was asked to make up a sign announcing their plans to Giggle Ridge fans. The artwork on the sign was largely a rework of our old plans, even though the new park would now have so much more. In the last few weeks I have been busy at my drawing table working up ideas for the new park. This is what we call blue sky dreaming. Anything is possible at this stage. My instructions were to make the new park as spectacular (or more) than the original Giggle Ridge. Much of the new park is still under wraps and subject to change. This is the nature of theme park planning. 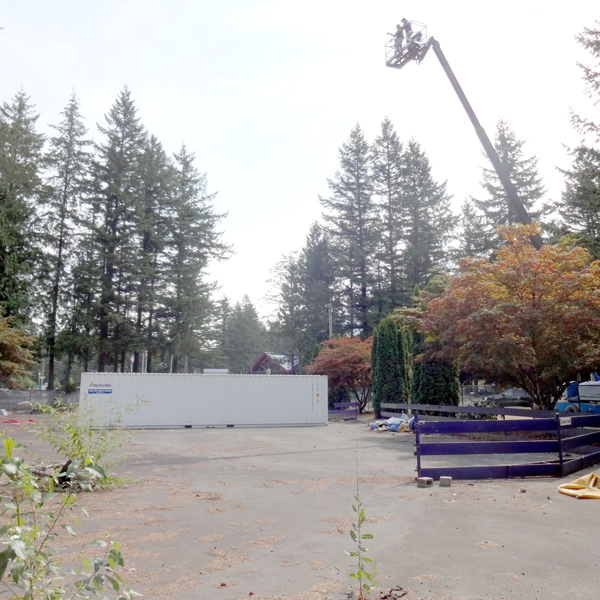 But suffice to say the new adventure park is going to be great to say the least. Today we spent some time at the site, measuring and spraying all kinds of paint lines onto the ground. We'd take a look, scribble them out and then draw new ones, working out the space requirements for each attraction. We also took some rides in a giant snorkle lift to get an idea of attraction heights and views. This is the height of the tallest planned attraction. While up in the lift we could also look down and get a bird's eye view of our pink spray-painted lines to decide how everything was fitting together. Things worked out pretty well but I'll be making a few adjustments to the concept drawings. It was fun to talk with the owners about the things I was thinking about. As we walked the bare dirt I could clearly see the finished park in my mind. I could visualize the sloped walkways, the themed architecture and signs, smell the rightly colored flowers and hear the sounds of the new attractions. My job was to try and explain this vision to the owners. The owners also had many great ideas to add to the mix. We discussed many, many things, made small changes and noted new ideas. After a couple of hours at the park I was ready to head back to the drawing board. Blue sky dreaming is FUN!